Gustav Edvin Adolphson (25 February 1893 – 31 October 1979) was a Swedish film actor and director who appeared in over 500 roles. He made his debut in 1912. He appeared with Ingrid Bergman in Only One Night (1939), and is noted for his roles in the film Änglar, finns dom? (1961), the television version of August Strindberg's Hemsöborna (1966), and as Markurell in Markurells i Wadköping (1968). He also directed the first Swedish sound film, Säg det i toner in 1929. 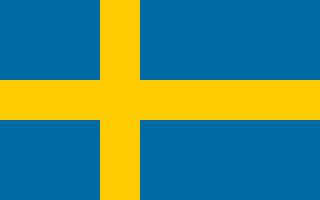 Sweden, officially the Kingdom of Sweden, is a Scandinavian Nordic country in Northern Europe. It borders Norway to the west and north and Finland to the east, and is connected to Denmark in the southwest by a bridge-tunnel across the Öresund, a strait at the Swedish-Danish border. At 450,295 square kilometres (173,860 sq mi), Sweden is the largest country in Northern Europe, the third-largest country in the European Union and the fifth largest country in Europe by area. Sweden has a total population of 10.2 million of which 2.4 million has a foreign background. It has a low population density of 22 inhabitants per square kilometre (57/sq mi). The highest concentration is in the southern half of the country. Ingrid Bergman was a Swedish actress who starred in a variety of European and American films. She won many accolades, including three Academy Awards, two Emmy Awards (Primetime), four Golden Globe Awards, a BAFTA Award, and a Tony Award. She is best remembered for her roles as Ilsa Lund in Casablanca (1942) and Alicia Huberman in Notorious (1946). Only One Night is a 1950 West German drama film directed by Fritz Kirchhoff and starring Marianne Hoppe, Hans Söhnker and Willy Maertens. He was actress Harriet Bosse's third husband (1927–1932) and is father of actress Kristina Adolphson (b. 1937) and songwriter/composer Olle Adolphson (1934–2004). Adolphson was born in Furingstad, Sweden (Östergötland County), and died in Solna, a suburb of Stockholm, Sweden. Harriet Sofie Bosse was a Swedish–Norwegian actress. A celebrity in her own day, Bosse is today most commonly remembered as the third wife of the playwright August Strindberg. Bosse began her career in a minor company run by her forceful older sister Alma Fahlstrøm in Kristiania. Having secured an engagement at the Royal Dramatic Theatre ("Dramaten"), the main drama venue of Sweden's capital Stockholm, Bosse caught the attention of Strindberg with her intelligent acting and exotic "oriental" appearance. Kristina Adolphson is a Swedish film actress. She was born in Stockholm, Sweden. Her father was actor Edvin Adolphson, and she was married to actor Erland Josephson. Olle Adolphson was a Swedish writer, singer and songwriter. He released a range of books, LPs and CDs. The Triumph of the Heart is a 1929 Swedish silent film directed by Gustaf Molander and starring Carl Brisson, Lissy Arna and Edvin Adolphson. The film was made in partnership with British International Pictures and was given a British release in 1930 under the alternative title of False Gold. Love and Deficit is a 1932 Swedish comedy film directed by Gustaf Molander and starring Sigurd Wallén, Tutta Rolf and Edvin Adolphson. Russian Flu is a 1937 Swedish comedy film directed by Gustaf Edgren and starring Åke Söderblom, Karin Swanström and Sickan Carlsson. It was the second Swedish film of the Norwegian actress Kirsten Heiberg. Stanislaus Pascal Franchot Tone was an American stage, film and television actor. He was Oscar-nominated for his role as Midshipman Roger Byam in Mutiny on the Bounty (1935), starring alongside Clark Gable and Charles Laughton. He was a leading man in many films and appeared as a guest star in episodes of several television series, including The Twilight Zone and The Alfred Hitchcock Hour. John Regis Toomey was an American film and television actor. Gustaf Harald August Molander was a Swedish actor and film director. His parents were director Harald Molander, Sr. (1858–1900) and singer and actress Lydia Molander, née Wessler, and his brother was director Olof Molander (1892–1966). He was the father of director and producer Harald Molander from his first marriage to actress Karin Molander and father to actor Jan Molander from his second marriage to Elsa Fahlberg. Margit Carlqvist is a Swedish actress. In Sweden she starred in many movies during the 1950s. Internationally, she may be best known for her role in Ingmar Bergman's film, Smiles of a Summer Night. Gustav Fröhlich was a German actor and film director. He landed secondary roles in a number of films and plays before landing his breakthrough role of Freder Fredersen in Fritz Lang's 1927 film Metropolis. He remained a popular film star in Germany until the 1950s. Allan "Rocky" Lane was an American studio leading man and the star of many cowboy B-movies in the 1940s and 1950s. He appeared in more than 125 films and TV shows in a career lasting from 1929 to 1966. He is best known for his portrayal of Red Ryder and for being the voice of the talking horse on the television series Mister Ed, beginning in 1961. Lau Lauritzen Jr., was a Danish actor, screenwriter, and film director. As a director, he was a 4-time recipient of the Bodil Award for Best Danish Film. Lauritzen co-founded the Danish film studio ASA Film and served as the studio's artistic director (1937–1945) and administrative director (1945–1964). Alice O'Fredericks was a Danish actress, screenwriter, and film director. She is best known for directing the series of Far til Fire comedies and the series of family dramas based on Morten Korch novels. Having written 38 produced screenplays and directed 72 feature films, O'Fredericks was one of the most prolific directors in Danish cinema. O'Fredericks also directed the first Danish films which highlighted women's rights. The Alice Award, presented annually to the Best Female Director at the Copenhagen International Film Festival, is named in her honor. George Fant was a Swedish actor, director and theater manager. He appeared in 50 films between 1936 and 1995. He was father of actor Christer Fant. Edward Frank Dunn was an American actor best known for his roles in comedy films,supporting many comedians such as Charley Chase, Charlie Chaplin, WC Fields and Laurel and Hardy. He appeared in a 1950 episode of the TV series, The Lone Ranger entitled "Man Without a Gun". Dunn also appeared as "Detective Grimes" in several of The Falcon series of films in the 1940s which starred George Sanders and later on his brother Tom Conway, and in many small and uncredited parts in many feature films until his death in 1951 aged 55. Björn Berglund was a Swedish stage and film and television actor. Axel Stig Hansson, known professionally as Jules Sylvain, was a Swedish composer, screenwriter and musician. Nils Kihlberg was a Swedish actor, singer and director known for En trallande jänta (1942), Bröderna Östermans huskors (1945) and Det är min musik (1942). He died on April 2, 1965 in Stockholm. Nils appeared in approximately 40 films and He was married to actress Mimi Nelson. Astrid Bodin was a Swedish actress who appeared in over 120 films. Born on 10 July 1903 in Österunda, Sweden, she began her film-acting career with a small role in 1933's Djurgårdsnätter, starring Erik Berglund and Anne-Marie Brunius. She appeared mostly in smaller roles, many times un-credited. Her final performance was as an unnamed woman in Börje Nyberg's Svenska Floyd (1961), which was released on her 58th birthday, 10 July 1961. She died on 20 October 1961 in the Kungsholms area of Stockholm, Sweden, at the age of 58. Sam Nelson was a director and assistant director who worked from the end of the silent era right up through the early 1960s. While most of his film work was in the assistant director role, he did direct over 20 films during the 1930s and 1940s, all of which were westerns. As an assistant director he worked on such notable films as Pennies from Heaven, And Then There Were None, All the King's Men, the original 3:10 to Yuma, Some Like It Hot, A Raisin in the Sun, and Spartacus. In addition he appeared in over a dozen films in small roles. Olof Oscar Hemberg (1881–1944) was a Swedish newspaper editor, writer and film producer. He has been credited with writing 21 films and producing eight films. Hemberg is best known for writing many screenplays for the director Schamyl Bauman including Witches' Night (1937) starring Gösta Ekman, På Solsidan for Gustaf Molander, starring Ingrid Bergman, and The Girls' Alfred (1935) for Edvin Adolphson, starring Sture Lagerwall. He also wrote the screenplay for the Danish film Idag Begynder Livet for Lau Lauritzen Jr. and Alice O'Fredericks. Furthermore, Hemberg produced several films for Gustaf Molander, including Paresiennes, and His English Wife, as well as Bara en danserska by Olof Molander. Love Mates is a 1961 Swedish comedy film directed by Lars-Magnus Lindgren. Only One Night is a 1939 Swedish romantic drama film directed by Gustaf Molander and starring Ingrid Bergman, Edvin Adolphson and Aino Taube. Bergman agreed to appear in the film in exchange for being given the lead role she sought in A Woman's Face the previous year.